Since the theatre doubles as a rehearsal studio and classroom in the daytime, the stage area must be completely cleared (i.e. all props and set elements must be struck from the stage area each night and neatly stored in predetermined areas) as part of each tech call. No equipment may arrive at the theatre prior to the load-in day. No sets/props may be brought that don't store safely in the 10' x 4' area house left. No equipment or sets may stay after the run of a show, all items must be taken away on closing night. Absolutely no painting or set construction may take place in the theatre, and no holes may be made in the stage floor or walls. Rental clients are required to provide a detailed production schedule one (1) week prior to load-in. As well as a provided Production Summary one (1) week prior to load-in intended to communicate all technical requirements. 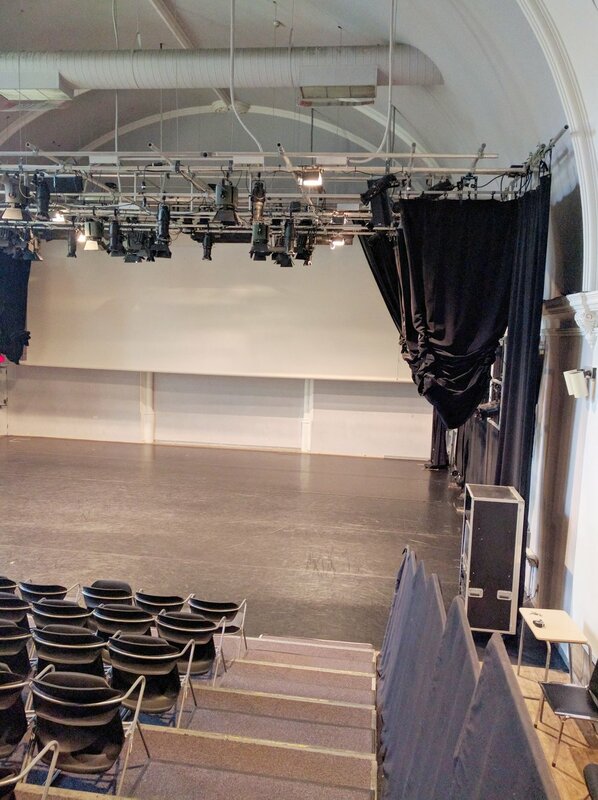 Any changes made to the standard lighting, masking and audio configuration must be approved in advance by the Technical Director and restored within the client's rental period. These proposed changes must be sent to the Technical Director one (1) week before the show, otherwise the current house plot and set up with no changes will be available for use. Any use of projection must be discussed in advance with the Technical Director, and detailed in the Production Summary. The client is solely responsible for ensuring compatibility of video signal source, as well as all aspects of operation of video elements. The theatre may not be used as a reception area. No food or drink is allowed in the theatre. The building contains an additional 3-phase 100amp service for optional use by film/video shoot rentals. It is located approximately 100' from the stage. A certified electrician is required to perform tie-in. A usage fee of $100/day applies. The Tech Package and all associated paper work is subject to change at any time, please contact the Technical Director for further information. We do endeavor to keep all of our information up to date, however due to the nature of the use of the Main Theatre we ask that you email the Technical Director to discuss any major changes you would like to make in the space i.e. lighting, sounds, masking, etc. For more detailed information please have a look at our Sample Contract, Sample Production Summary and Sample Renter's Welcome Sheet, these will help give you a better idea of what we can provide and what we need from you as a renter. Capacity: 128 seats, with an optional 15 seats added in front. *Note we typically remove 2 chairs at the back of the audience for videographers. The building is , unfortunately, not wheelchair accessible. Rosin May Not be used on either floor. Standard performance area: 24’-6” deep x 34’ wide. Access from the Dressing Rooms to the stage is through the backstage stairwell and through the door up stage right. There is a Crossover behind the cyc/scrim, 3’ wide, and accessible from the up stage right stairwell or from up stage left. There is a Cyclorama, a black sharkstooth scrim, legs. There is no blackout drop, nor a main curtain. The masking systems have been designed to provide maximum space for daytime classes and rehearsals. Legs are on rope and pulleys, the scrim is on a track, and the Cyc is on an oleo. It takes approximately 15 minutes to set up masking at the beginning of call, and the same to strike at the end – this must be done during clients’ time. The front doors and Loading doors for the theatre face Winchester Street, and enter the space into the House Left area. The dimensions are 7’-4” x 5’-4” and 7’-4” x 5’-6” respectively. The lighting and sound control booth is located in the mezzanine of the room. The size of the booth area allows for 2 people. Our standard operating situation is to have the Stage Manager and House Technician in the booth, each operating either lights or audio. Alternative SM positions are beside booth area or backstage. In such an event, a second booth operator would have to be supplied, either by the client, or by the Theatre (at the client’s expense). 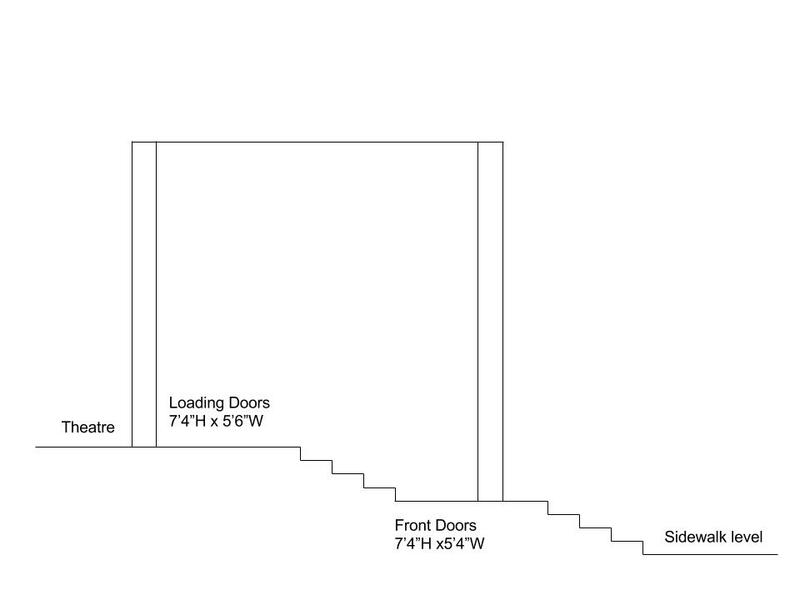 Located beneath stage level, the dressing rooms are accessible via the backstage stairwell (see ground plan). There are 2 dressing rooms available for use by rental clients. 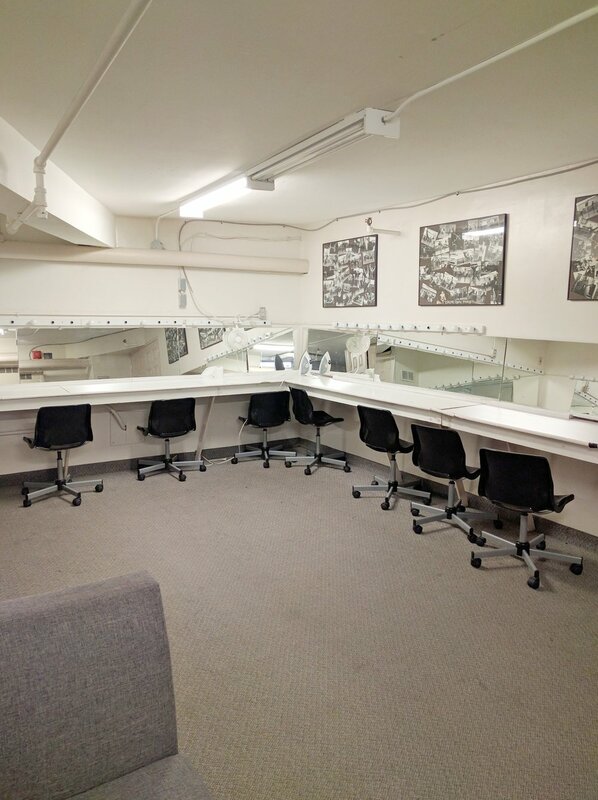 The main dressing room/lounge is 13’ x 21’ and is equipped with makeup space, mirrors, and vanity lights. It also contains a 5’ x 2’ wardrobe closet that costumes may be stored in for the whole run. The second room is much smaller, 9’ x 6’. Bathrooms are located close to the dressing rooms. Wardrobe facilities are not available to rental clients. There is no Orchestra pit, clients in the past have flown out the first 2 legs down stage right to form orchestra area, and have also stationed musicians onstage. It is possible to make space off the seating risers House Left, however a path 3’-7” must be left due to fire regulations. The theatre owns no music stands or lights. For more information or to rent, please contact the Technical Director at theatre@tdt.org.